Ok, so think about this: if Buddha spent most of his time meditating, fasting, living off vegetarian food, and hiking everywhere, how would he get fat? 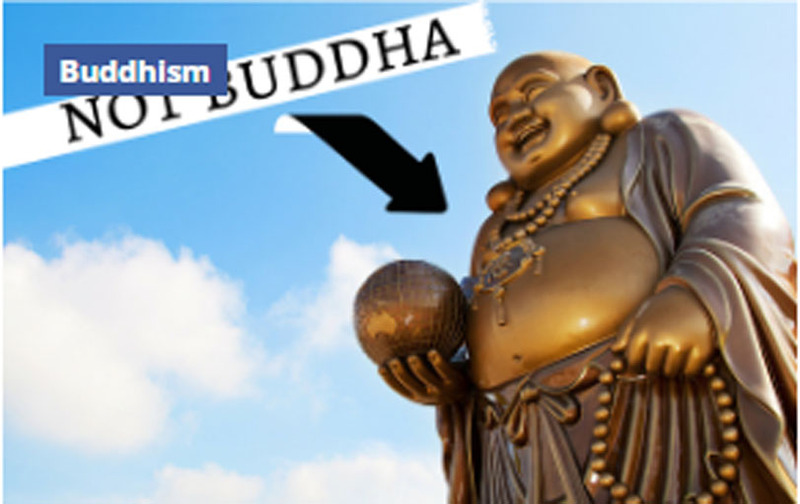 The idea that Buddha was somehow fat is actually a complete myth; not only that, but it’s also not even the same person! The use of the fat Buddha seen everywhere in Chinese restaurants and Chinese culture is actually a zen monk named Budai. Budai lived in the 900’s and was considered to be a saint. He lived in a monastery and ate heartily, blessing the nearby town. Lots of people think that the Dalai Lama is basically the “pope” of Buddhism. The Dalai Lama is the leader of Tibet only. While we have democracy here in the west, Tibet had an extremely unique form of government for thousands of years. Basically, when their spiritual leader died, they would go out and try to find his reincarnation, so that he could continue guiding the nation. It’s sorta like having an eternal leader; except he’s a lot nicer than most. This would not be any different if we went out and tried to find the reincarnations of those who signed the constitution, and put them back in government again and again (except they’d have WAY better teeth this time around). Lots of people refer to Buddha when talking about Buddhism. But did you know that’s not his real name? His real name is Siddhartha Gautama. Siddhartha was born a prince and left his worldly riches in order to achieve enlightenment. Once he had attain this final state, he became known as the “awakened one”, or “Buddha” in Sanskrit. Anyone who attains enlightenment can be referred to as a Buddha, not just Siddhartha. From the beginning, Buddhism had the interest of the eastern cultures. However, it didn’t have the foothold like Hinduism did. Though Buddhism started in India, it seemed to have trouble getting large amounts of people to stick to it. Hinduism and Buddhism share many similar traits, and so Hinduism simply called Buddha an incarnation of Vishnu and absorbed him into their pantheon. This was part of the new movement we see today in Hinduism, similar to reformation in Christianity. Turkish and Arab invasions (over a period of hundreds of years) destroyed many temples and made it their mission to keep old masters from training new disciples. These, combined with a inability to communicate effectively in those times, made it hard for Buddhism to flourish in India; even though cultures China, Japan, and Tibet embraced it nationally. Since there isn’t really anyone to worship in Buddhism, temples are generally just places where people come to study the teachings and meditate. But the most important aspect of Buddhist centers is their ability to give practitioners space to seek enlightenment, not worship.